IGN has a good hands on preview of the soon to be released "survival pack" for Valve's zombie hit Left4Dead. The DLC will hit some time in March or April or Valve is reportedly trying to get the DLC released at no cost to the consumer. The pack will contain a whole new game type, Survival Mode, and new versus maps. Valve is probably the best publisher around for aftermarket content at no cost. One of the four preview videos here. 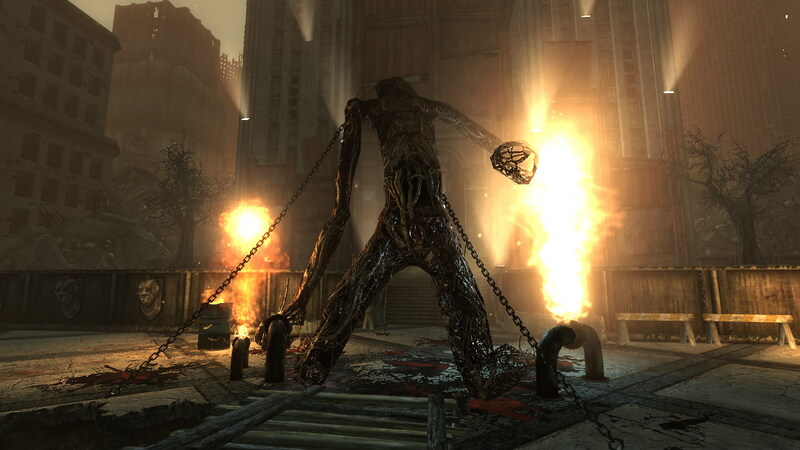 Bethesda Studios today did their usual release three screen shots and only three screen shots thing, this time with soon to be released DLC The Pitt. 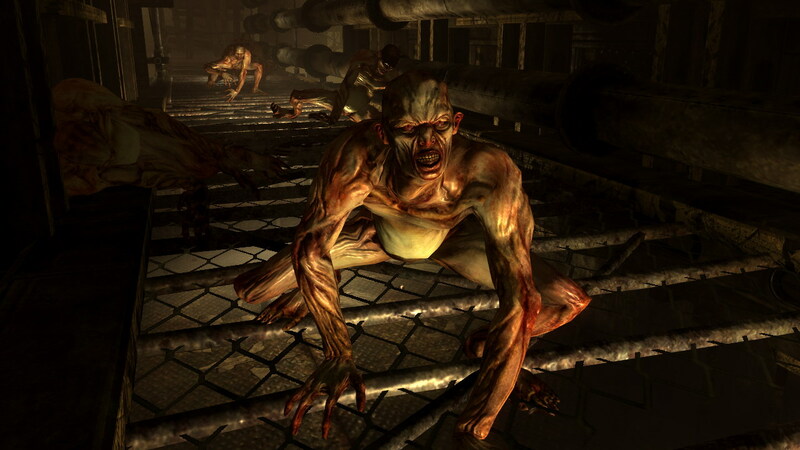 The DLC will have your character traveling to what was once Pittsburgh, one of the few cities to not be hit by a bomb, but however was afterwards covered in radiation from the three rivers, in search of a mutant cure. Images thanks to Kotaku. I do look forward to Puzzle Quest: Galactrix, even though I still haven't finished the original's DLC and I think Hasbro Family Game Night will be great for us achievement whores (some how its got 1200 GS points to be had, even though the arcade maximum without DLC is 200). Otherwise it seems like some crap remakes and some of questionable quality, but I'll take the XBLA over the PSN any day. Kotaku's got a review up of 360 arcade game Watchmen which is a supposed to be a prequel to the comic book/movie. As usual their reviews don't contain any kind of number or letter grading system. A bit disappointing the game is apparently. Too bad, this is one game I was looking forward to. Warner Bros - the publishers backing this game - may have thought that pushing a $20 price tag on the game and releasing it as a downloadable title would help us overlook the game's many, fundamental flaws. It doesn't, as the one area you'd expect such a title to skimp on - the graphics - is about the only thing they got right. Rare, through their BK spokesman Lord of Games (LOG) has begun hinting at new DLC for the Fall 2008 release. We're still awaiting Banjo Tooie to be released on the XBLA and honestly I'd prefer that over this way before. I've already finished this game and it was quite a pain and towards the end quite boring and don't really want to have to pick it back up just to keep my achievement percent up, especially considering I've already Goozexed it. Videogamer.com sat down with an cultral antropologist in the UK and had him give his opinion on the idea that Resident Evil 5 is full of racism. He was not content with merely hearing the story and watching videos so they had him play through the first three levels of the game. VideoGamer.com: Is it the case, then, that it's being accused of being racist because game journalists feel that they should feel it's racist? GB: That's interesting. I think it ties in with what I was talking about, about inverse racism. That in a sense there's a politically correct position which says this should be your knee-jerk reaction to what's going on there. I think it's quite likely but I'm not sure that in any way the makers of this game can be held responsible for that kind of response. I think that might be possible, in which case I think what they really should be asking themselves is, although I can't imagine people would do this, why are they having those kind of responses? And what negativity is implicit in that positive response? And the negativity is that actually we don't look at people as human beings, we look at them as black and white. He makes mention of colonialism as a cause for the behavior of the characters in the game and how he doesn't really feel that the game is racist in the sense that everyone thinks it should be. Five years ago you could find two or more games on shelves for each of the major sports. There was NFL 2k and Madden, MLB 2k & Triple Play. Well once the leagues determined that they could make more money by forcing the publishers to bid on the rights, that competition is no more. Madden stands alone in professional football, 2K alone in baseball, EA is alone in NCAA football and basketball, and 2k might as well be alone in professional basketball because NBA Live is horrendous. The only popular American sport not yet exclusivized is hockey and we all know that with the most recent player's strike, the NHL needs all the fans it can get so exclusivity is really not in the picture for them. Competition breeds improvement. Just a look at the war waged between Pro Evolution Soccer and FIFA over the past decade. For years PES lead the way in gameplay over the uber-licensed FIFA series. EA, assumingly tired of continuously losing in quality to Konami finally begun putting out a better product with FIFA 07 on the Xbox 360. With its most recent outing in FIFA 09, EA has managed, according to most reputable non-fanboys, to have taken their product beyond the quality of the recently stagnant PES. This exact same scenario occurred, more or less, across all of these sports games until exclusivity came along. Much is lost in the use of these exclusive deals. What happened to American Needle in relation to apparel is essentially what happened to Take-Two in regard to its excellent NFL2K series when EA scored its exclusive license with the NFL in 2004. My fingers are crossed that this case turns out in favor of the consumer. While a shared game market means that we must put up with fanboyism (the fact that NFL 2k is gone doesn't mean that we don't still continuously hear "NFL 2k5 was better") the quality that will come from such an end will be worth it all. Amazon.com will be entering the used game biz, while GameStop says that there is no chance that they'll succeed. Gamefly will begin putting their version of the McDonald's redbox throughout the U.S.
2K Games has begun their teasing/viral campaining of Bioshock 2.